On the Mindful Leader Programme, we’re thrilled to offer insight and access to a variety of mindfulness and emotional intelligence experts, content, and upcoming events. 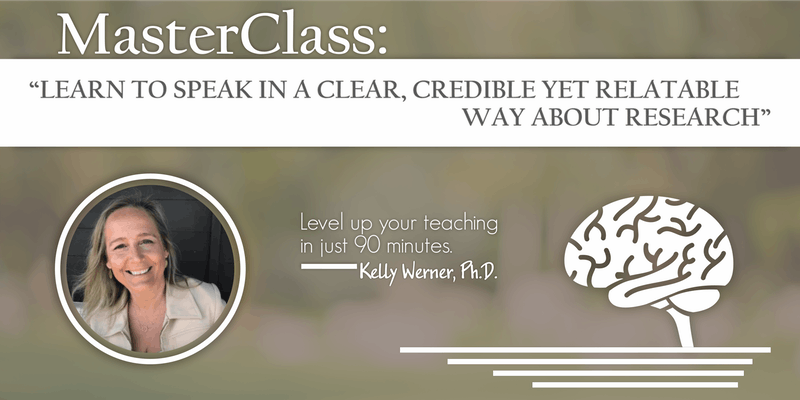 This week, we’re here to share an exciting new opportunity with Kelly Werner, Ph.D. Kelly invites you to join her for her online 90 minute online masterclass. She kindly shared the content below and more information if you’d like to sign up. Why talk about science in a mindfulness and emotional intelligence course? It informs the practice. The moment you understand how the brain works, you are more motivated to practice! “My friend and teaching partner at both PurposeBlue Mindful Leadership and SIYLI is holding a webinar on the neuroscience of mindfulness and emotional intelligence. I have heard Kelly articulate in clear language the fascinating science of how practice affects the brain, and ultimately our emotional states and ongoing traits. She cuts through the hype, the speculation and the myths and speaks directly to what we know and what is the frontier of the learning in this space.” Laurie Cameron, Author and Founder of PurposeBlue Mindful Leadership. This webinar will address how we engage with the science of mindfulness and emotional intelligence from the perspective of rigour as well as humility. How we understand the science and present it with precision as well as a real eye towards the fact that the science is in it’s infancy. We’ll look at how to find credible sources on the internet, and how to digest these articles with a more critical eye. We’ll look at study design, generalizability and control conditions. Next as we think about presenting the science, I’ll talk about how to phrase findings, how to find study details to make a science story engaging and interactive, and we’ll think a bit about how to engage your audience as you are speaking. The field of the neuroscience of mindfulness is moving from an understanding of how the brain works with reference to mindfulness. Instead of discrete areas supporting certain functions, we’ll take a more holistic view and learn about how to look at the brain as networks of information processing rather than specific brain areas, which is more accurate for how the brain works. You’ll gain a richer understanding of the default mode network, as well as how mindfulness facilitates emotion regulation at the neural level. By the end of the 90 minutes you’ll feel more empowered to understand and speak about the science supporting mindfulness and emotional intelligence practices to your audiences. Early Bird fee of $55 is available till 8/8/18 11:59pm Pacific Time, and raises to $75 on 8/9/18 Pacific Time. If you can’t make 8/17/18, e-mail drwernertrainings@gmail.com to be alerted of the next one. Sign up here to register for the webinar.